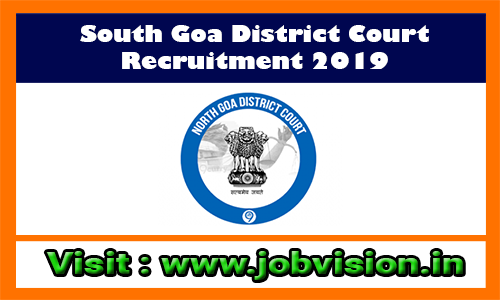 South Goa District Court Recruitment 2019 - South Goa District Court invites applications for recruitment of 99 Stenographer Grade-III, Lower Division Clerk, Bailiff, Process Server, Peon, Watchman, Driver Posts. The applicants are requested to Download Application Form through Official Website https://districts.ecourts.gov.in/southgoa. The last date for the receipt of application along with enclosures is 30.03.2019. Interested candidates are requested to peruse the advertisement regarding the process of Examinations and Interview, Eligibility Criteria, Application Fee, How to Apply, Pattern of Examination, Syllabus, Question Paper, Admit Date, Exam Date, Result Date etc,. Refer thoroughly before applying. 6. Bailiff (a) Middle pass or VIII class pass or equivalent with knowledge of local languages. (b) Knowledge of Konkani. 7 Process Server (a) Middle pass or VIII class pass or equivalent with knowledge of local languages. (b) Knowledge of Konkani. 8 Peon (a) Middle class or equivalent preferably with English. (b) Knowledge of Konkani. South Goa District Court may follow the following process to select the candidates. Eligible candidates are advised to Download Official Notification & Application Form at official website to https://districts.ecourts.gov.in/southgoa.Fill your Academic Qualification & Other Related Information as per the instructions. Hard Copies of the signed application along with photocopies of (i) ID proof (ii) Proof of Date of Birth (iii) Educational Certificates: Mark-Sheets/Degree Certificate (iv) Caste and attested copies of relevant documents mentioned in the application should be addressed to “Office of the Principal District & Sessions Judge, South Goa, Margao” super-scribing the envelope with “Application for the post of ______” so as to reach on or before 30.03.2019.